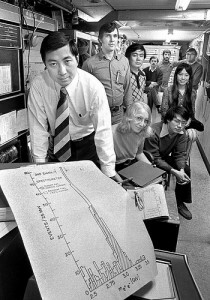 The independent discovery of the J/psi by Samuel Ting (front) of the Massachusetts Institute of Technology, at BNL’s Alternating Gradient Synchrotron, and by Burton Richter, of the Stanford Linear Accelerator Center, earned its co-discoverers the 1976 Nobel Prize in physics. 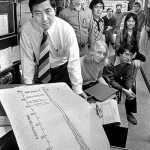 Shown with Ting in this photo are members of his experimental team. 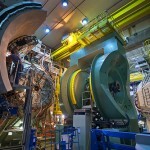 This entry was posted on Friday, January 7th, 2011 at 4:02 pm	and is filed under . You can follow any responses to this entry through the RSS 2.0 feed. You can leave a response, or trackback from your own site.